Insect Screens | Aluprof S.A.
A swarm of mosquitoes or wasps hovering around the table can kill the most agreeable summer evening. Using fly screens is by far the ideal solution. Fly screens are a practical and an extremely functional protection against insects. Aluprof offer includes three fly screen solutions: fixed, hanged and sliding systems, two roll up solutions and pleated insect screen. Thanks to this diversity, we can choose a fly screen that is suitable for all types of windows and rooms. Fly screens’ design allows an easy installation on window and door profiles. MRO hinged fly screen is perfectly suited for the balcony door. In rooms where we need regular protection, such as bedroom, bathroom or child's room, it is a good idea to use MRS fixed frame fly screen. Due to the fact that aluminium joinery begins to play an increasingly important role, and this not only in office or commercial buildings, but also in residential facilities, we decided to modify our fixed mosquito screens, so that they can be installed on flush aluminium windows. The MRSZ system does not limit in any way the functionality of the window. 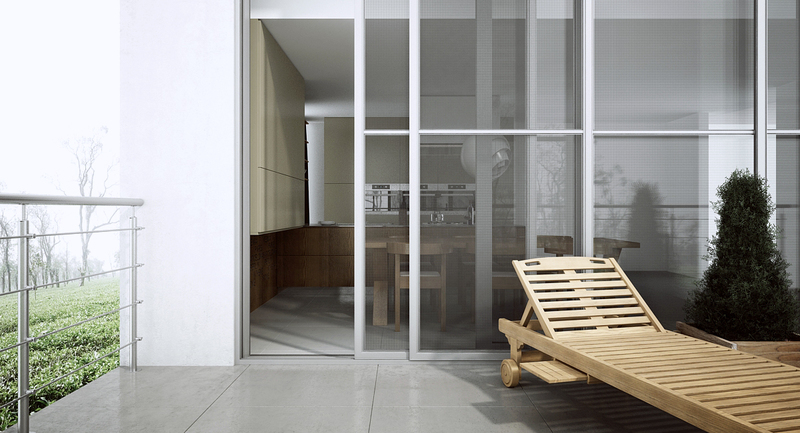 As for the terrace walkout, the ideal solution would be to use MRP sliding fly screen. The roll up insect screen MZN is perfect choice for kitchens.The big advantage of this product is that it can be closed and opened at any time. This will be surely appreciated by all the mums who may want to control the security of their children playing in the back yard. With a view to protect attic spaces we developed the insect screen MZH. This solution is equiped with a specially designed hook-in connection that enables the installaton on roof windows. The pleated insects screen MPH is a novelty in Aluprof's range. It was designed with the aim of providing space savings while they guarantee the optimal use of the surface. Aluprof fly screens are made of aluminium and are available in many colours, allowing for proper fit of the product to the window frame and the building façade.